I recall her being in her early 60’s. Most of the time she was in bed requiring frequent re-positioning to keep her from getting bedsores. She demanded a huge amount of time and attention, much more than anyone else on the unit. 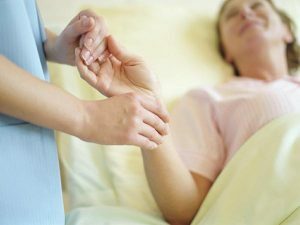 She was extremely particular about her care, everything had to be just so and it seemed like the nurses or aides were continually in her room trying to satisfy her. Once in a while we would time her, to see how long it would be between when we left her room and when she would turn her call light on again. As nurses responsible for many patients, we felt resentful at how much time we had to give to her compared to the others on the unit. One day I went into her room to tend to her. As a young, busy nurse I know I wasn’t as patient and understanding as I should have been. I had a point to make and today was the day I made it. “It must feel great getting so much special attention.” I said to her matter of factly. Mary’s voice shifted and I stopped in my tracks. Perspective. Everything changed for me in that moment. This was Mary, suffering from Multiple Sclerosis for I can’t remember how long. Stuck in either her wheelchair or her bed. Dependent on others for absolutely everything at an age where she should be playing on the floor with her grandchildren. This was Steph, a cocky young nurse who took the time out of her day to make a backhanded comment intended to make her feel bad about taking time away from other patients. Imagine having no privacy. Imagine not being able to scratch your back, move your leg or get yourself something from the night table. I couldn’t even, and still can’t, imagine these things. That day our relationship changed from patient/nurse to friends. My entire attitude, when answering her call light or entering her room or adjusting a limb that wasn’t quite right, shifted. With her permission, I began to go into her room when her call light wasn’t on. I went in not because I had to but because I wanted to. I encouraged staff to knock and wait until she said, “Come in.” Her room was an extension of her personal space and we had to relearn how to respect that. These days, two decades later, I still think of Mary every time time I see a Gooseberry in the grocery store. My face scrunches up at the thought of it just like it did when she offered me one of hers to try for the first time. I think of her when I see a Chicken Soup for the Soul book, because after she enlightened me, I took extra time with her and would read her a story before bed. Today, I invite you to think about who or what’s driving you crazy and look at the situation and/or the person from a different perspective. Sometimes it’s just the smallest shift that makes you go ‘click’ and the situation seems entirely different. To my Mary, you were contrary, but you had every reason to be. Life dealt you a tough hand and you played it as well as could be expected. Thank you for giving me the gift of perspective which helped me to be, not only a better nurse but, a better human. This entry was posted in Empowerment, Happiness, Health Care, Love, Newsletters and tagged e-news, health, personal growth, Stephanie Staples, Your Life Unlimited. Bookmark the permalink. Next Next post: What Is Your Relationship With Time?